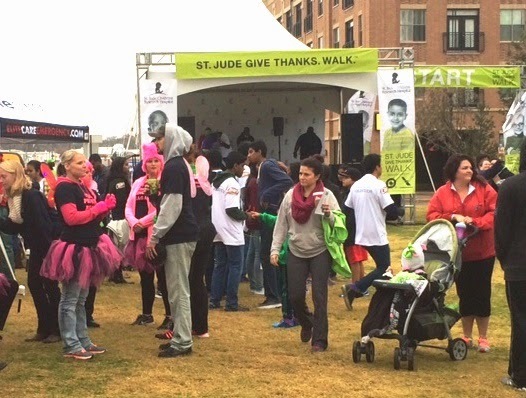 Despite rainy, cool weather, the St. Jude Research Hospital for Children "Give Thanks Walk 2014" went off as scheduled in Dallas Saturday morning, November 22, 2014. Stacie Durman, Account Executive with American Receivable gave her time to assist runners, walkers and families who were participating in the event. More than 65 communities across the country took part in the family-friendly event that helped raise much needed funds to support the lifesaving mission of St. Jude's Research Hospital for Children. American Receivable is a long time supporter of St. Jude and the groundbreaking medical care they provide. American Receivable is proud to have Stacie volunteer her time with this fine institution.